Just some quick notes on a story I have been following, in large part because it is so important and yet so downplayed in the US media. By coincidence (I assume), the latest saber-rattling news was back on page 13 of the Friday the 13th edition of the Sacramento Bee. The front page headline story involved the closing of a local shopping center. Thanks to the internet, and especially British news sources, we learn that yesterday, Iranians accused the US of sending one of its ships into the 10 mile “maneuver zone” where the Iranian navy is conducting war games. 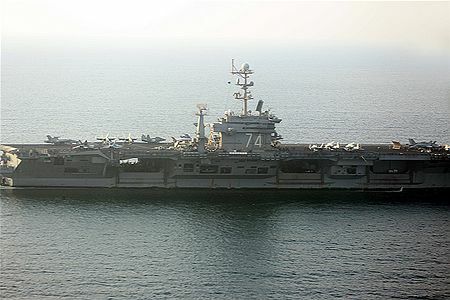 In response, Iran threatened to close the straits. The Obama administration said this would be a “red line act,” that would provoke a military response. The Times editorial went on to say economic sanctions do not appear to be working, but that may depend on who you ask. I caught an NPR interview with a correspondent in Iran who said, yes, they are working, just not perhaps as we want them to. He said he went to the store to buy an Oral B toothbrush and there wasn’t even toothpaste available. The citizenry doesn’t really understand the nuclear issue, but it does blame the US for mounting hardships. Meanwhile, I’m guessing Iranian leaders are not suffering a lack of toothpaste. The LA Times noted, you can’t assassinate collective knowledge. Sooner or later, Iran will have nukes. Another middle-east war will not close Pandora’s Box. Yet I still find it hard to believe that this is all about nukes. I’m thinking of Col. Andrew Bacevich’s 2008 predictions. http://wp.me/pYql4-1AT. Until we take the quest for energy independence seriously, armed conflict over oil will be our future. In 2011, Wikipedia estimated that the price of Tomahawk cruise missile was $830,000. How many scholarships would that buy for future energy scientists? How many studies of alternative fuels would that fund? How many lives and dollars are we prepared to spend trying to push back the river? This entry was posted in Culture, Current Events, Economics, News, Politics and tagged 2012, Culture, current events, News, politics. Bookmark the permalink.